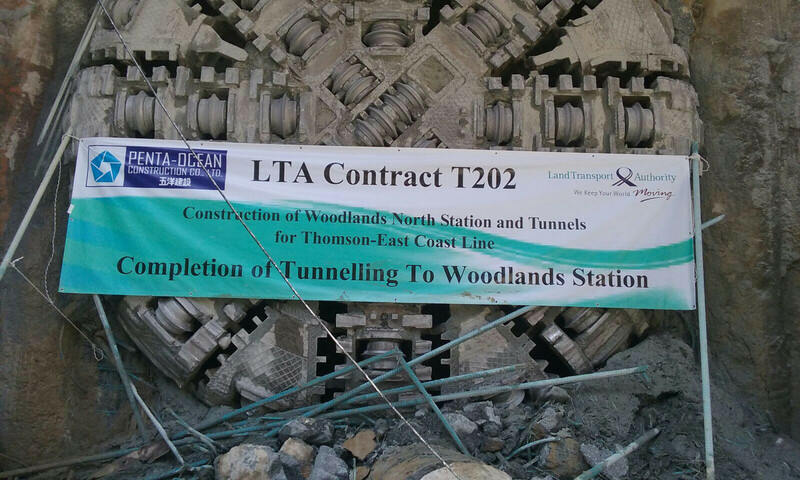 PSD is pleased to announce that its client, Penta Ocean Construction Co. Ltd, has completed tunnelling on T202 for Thomson Line in Singapore. Tunnelling was carried out using 2 No. 6740mm diameter slurry TBMs from Kawasaki. The first TBM launched on 4th December 2015 and completed on 7th September 2016 and the second TBM launched on 16th January 2016 and completed on 10th October 2016. Each TBM took 9 months and a total of 2028m was tunnelled in Bukit Timah granite and weathered Jurong formation. PSD supplied two STPs consisting of 2 No. SD2400DPs, 4 No. SM500PSDPs, 2 No. S5-1-G centrifuges, 2 No. S4-1-G centrifuges, flocculation and electrolyte systems and a remote monitoring system to allow the client access to the operational status of the equipment. The STP's provided the client with >99% STP availability and effectively zero sand content from start to finish. A PSD supervisor was present full time to oversee the operation and maintenance of the STPs. A spokesperson for POC stated that they had been impressed with the quality and reliability of the equipment and the support that they had received from PSD.